Walsine Pierce: PROGRESS TOWARD BLOGGING GOAL: It's A'coming! 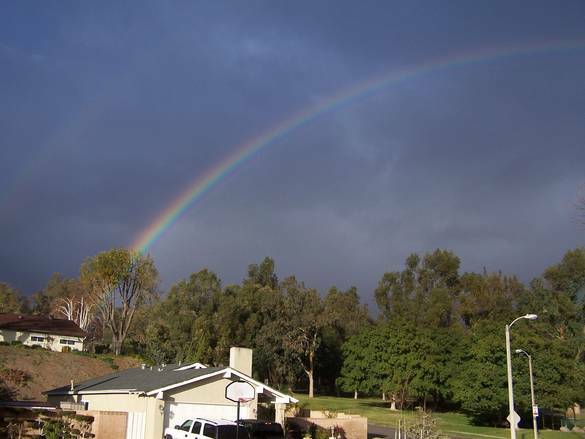 I can dream, and plan for my mid-spring cross-country camping trip to the National Parks and my drive to Simi Valley, California, seen under a rainbow in the above picture. The truth of the matter, however, is it is mid-winter in northeast Ohio and, as the old song goes, "Baby, its cold out there" . Retired for some 20+ years, I am mostly keeping pretty close to the house. I do keep busy doing this and that, among which is my blog writting. As with everything in my life, I set goals for myself in my blog. Since late summer my blog readership has tripled as can be seen on the chart above. Since inception in 2008, readership has run about a thousand a month. It is now over three thousand. 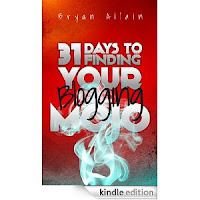 My son, Mark, gave me a book on my Kindle entitled "Finding your blogging MoJo". Following the suggestions in the book, I upgraded my blog in several ways and the results can be seen in this chart. My goal for this year is to double the readership again to 6,000 a month. The readership has now leveled off in the last five months. I LOVE A CHALLENGE! My previously most blogs written per month were 27 written in November, 2011. This is my 44TH blog written in January of 2012. Of course I do not intend to continue at this pace. The weather has been keeping me inside but that will change. Also, I have another writing goal beside my blog which is quite time consuming. I'll start that on February 1, 2012. Do you know what absolutely blows my mind? 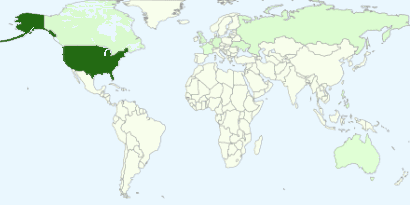 My blog is being read in 77 countries around the world! Take a moment and read the list on my blog page. Mostly people find the blog doing a subject search then I see them coming back to read day-by-day. I have commenced writing welcoming blogs to the new readers from these new countries. And, I am learning so much. Who in America knows much about Jersey or Macae, yet they are so interesting. Even countries I know about, like the Ukraine, I now know so much more than I did. While in Poland I now want to ground travel to Kiev, Ukraine. I am also learning what readers are mostly interested in. Would you believe that one of the most read blogs is anything about shanty boats. A LOT OF DREAMERS OUT THERE! I get great response to my travel blogs, one of the most is about Westminister Abby. I have also learned what people don't want to read, jokes. That surprized me. So far this month my blogs have been The Good Life, 44.2%, Politics, 25.6%, Wisdom, 21.0% and Humor, 9.2%. I'd like to balance out Politics and Wisdom, but this is how it worked out this month. The GOP debates probably were a factor. I DO NOT GET NEARLY THE FEED BACK i'D LIKE TO GET! The "Mojo" book said this was a problem pointing out how rarely we respond to blogs we read. That's true! Several suggestions were made, such as ending the blog with a question, which I've tried. I haven't significantly increased response. I'm still trying, the topic banner is one such effort. Most response is by email, which is okay. And, I have a faithful cadre of readers who faithfully respond, and send items of interest to me, which I use. Thank you so much! YOU ARE A REAL ENCOURAGEMENT TO ME. Well, as the song goes "That's my story and I'm sticking to it". One of my faithful and most responsive readers asked about the blog, she didn't see much response. I thought you might be interested also? Compared to my peers, the other 89 writers in Barberton, Ohio, my blog is many times what the others average, and is far ahead of the nearest. NONE OF THAT IS REALLY IMPORTANT TO ME! The blog is an opportunity to express myself and to share, which it gives me pleasure to do. Thank you for your interest!